Sometimes it was frustrating for foreign newsmen, and a number of them made a break to the more liberal climate of Beirut. But journalists engaged on their mini-exodus would only receive a smile from the officials at the Ministry of Information, who would nod and say, “You will return to the Nile.” Or they might mutter the oft-quoted words of the celebrated explorer of the desert, Ahmad Hassanein, “The desert is harsh and severe, but once you have known it, you will always return.” And the reporters usually did. Then in 1973 there came a change, probably the result of the success of Egypt’s campaign for the possession of the Suez Canal. President Sadat announced that it was time the Egyptian people were made aware of the facts “even if they are sometimes painful.” The news climate relaxed considerably; it finally was possible to buy copies of American magazines such as Time and Newsweek even if some stories were critical of Egypt. Prior to this, these publications had been banned by the authorities. 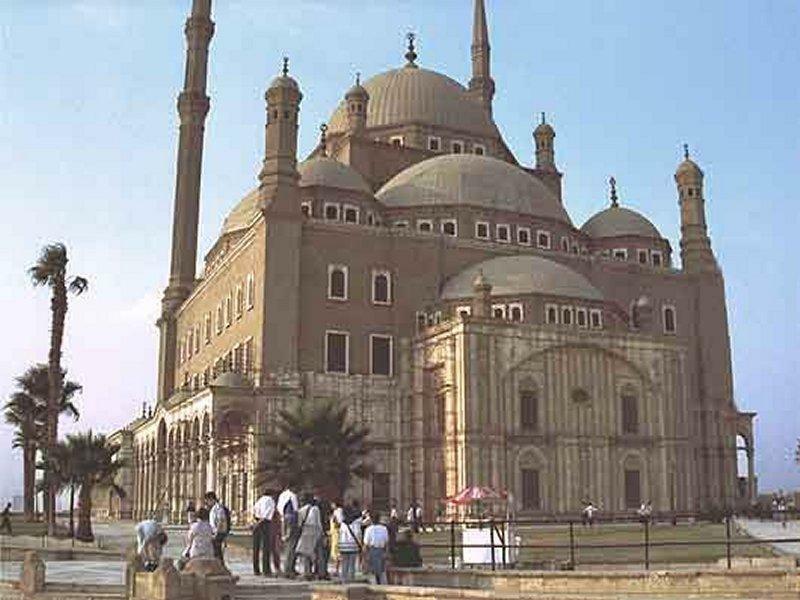 Not only in Cairo but throughout the Islamic world it is not unusual to be awakened in the morning by the sound of a sonorous wailing male voice from the next room. Someone is chanting the Koran. In my travels through the Middle East I have frequently been awakened by this chant. I always imagined that the voice belonged to an old man, his white hair giving him the semblance of a holy man, kneeling on the floor, facing Mecca and solemnly reciting his prayers. But bumping into my next-door neighbor on the way to breakfast, I was often surprised to find that the owner of the voice was a young man in his late teens or early twenties, carrying an attach case and enveloped in the scent of cologne. I would be slightly taken aback at the sound of his cheery “Good morning,” proffered in a somewhat high-pitched voice. 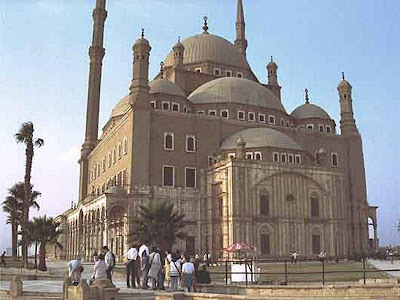 One of the unforgettable sounds of Egypt is the voice of the muezzin at dawn and sunset, solemnly calling the faithful to prayer. The voice is loud and resonant, and while it reverberates over the city the barking of the dogs and the cries of birds seem to be stilled. Even nonbelievers hearing the voice of the muezzin feel impelled to stand still, close their eyes and pray. The position of muezzin is hereditary, and boys start to receive voice training at a very early age. 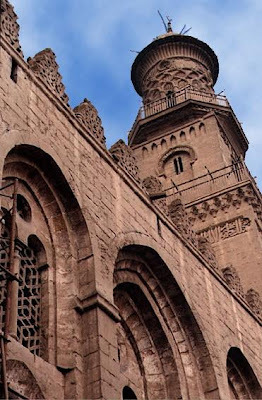 The muezzin of the Azhar Mosque, one of the oldest and most famed mosques in Cairo, enjoys a high social standing. When it isn’t praying, Cairo is a noisy, bustling city. With the rapid increase in the influx of people from the rural areas, Cairo has suddenly become a major world capital with a population of around eight million. The rise in the urban population has been accompanied by an equally dramatic increase in the number of automobiles. For example, in the late afternoon a steady stream of cars moves along the busy roads radiating like spokes from the city’s hub, Talaat Harb Square a place I prefer to call by its old name of Soliman Pacha Square. Suddenly there will be a screech of brakes and the flow of traffic will come to a halt to the accompaniment of a terrifying number of horns honking and the loud voices of drivers hurling abuses at one another. The windows of the automobiles are open, with the car radios blaring at full volume Arab music to the monotonous beat of the tambourine. Sitting in my car in the sweltering heat, I would soon join the chorus of yellers telling the world to get moving, almost without realizing I was doing so.